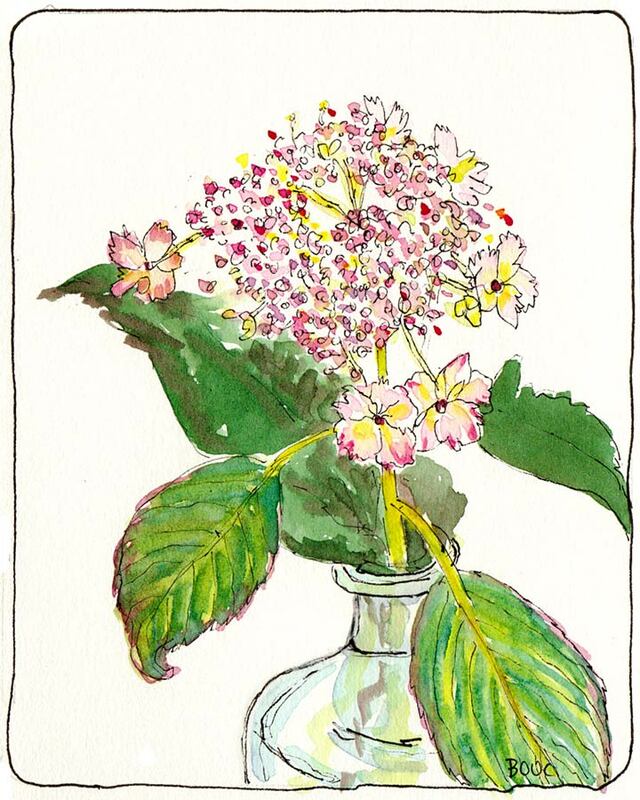 Baby Hydrangea for EDM #112: Fresh, ink & Watercolor, 6"x4.5"
The cue was to draw a flashlight. My favorite flashlight is my wonderful L.L. 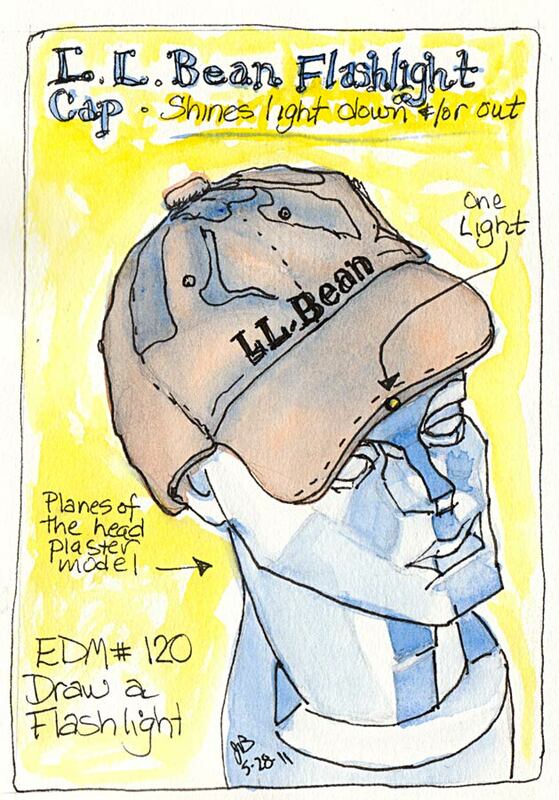 Bean Pathfinder Cap. It has two LED lights in the brim. One points straight down and is perfect for lighting your sketchbook when painting when it’s dark, and the other points ahead to light your path. You just squeeze a spot on the brim and it toggles between down, ahead or both. When painting in a dark pub it perfectly lit my sketchbook page but nobody could tell where the light was coming from. Someone came over to try to figure it out because it just looked like my page was illuminated. The hat is sitting on a plaster “Planes of the Head” cast, a tool for learning how to really see and draw heads (good article about this here). Although I wasn’t a faithful follower of “Sketch Every Day in May,” it reinforced how much I enjoy drawing. Some of the cues sounded boring but I discovered that no matter how dull a subject may seem, drawing it rarely is. A good reminder that art is in the process of it. I have enjoyed visiting your blog this morning! You captured those pesky hydrangeas very well. I nearly cut some yesterday for this purpose at a friend’s house, but couldn’t find a nipper. And the cap is smashing. Tee hee hee, that hat is a hoot! Both drawings are wonderful and that hat sounds fabulous. When I saw the hydrangea, I was thinking this one would be neat as a subject for oil too. Meanwhile, what you say about drawing is so true and it’s heartening to hear it said. Love your drawings! Be careful….hydrangea plants are on the poison plants list for cats and dogs. I had to fence off an area in my yard when my dog was a puppy because he ate everything in sight. Tomato plants are toxic also! Who knew?